Summary This article describes how to change the size of an ‘Other Specify’ input in askiadesign by using style. We recommend that this be one of the last tasks you perform before publishing your survey, as it requires customizing parameters on Screens, and these changes will be lost if you have to regenerate your screens for any reason. The Other, specify box is a screen object, so once a screen has been generated for the question with the Other, specify property, we can view the screen, select the object and modify its properties. We select the object by clicking it. Once it is highlighted, right-click and select Properties. Under Element properties, select the HTML tab and enter a Style statement in the Code in control input. Any of the parameters supported by the HTML Style statement may be used here, but we recommend that you KISS (keep it simple stupid) to ensure maximum compatibility across browsers. 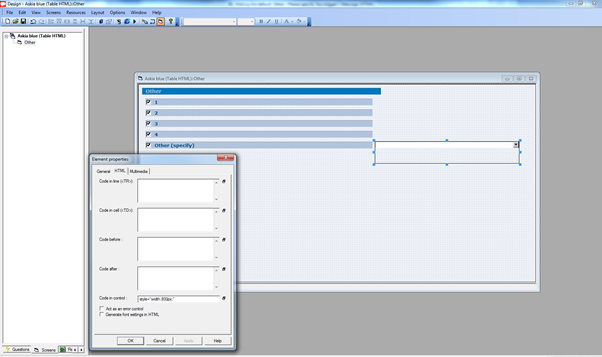 Note: If you have several such questions to customize, wait until you are ready to publish your questionnaire, then copy the style string to your clipboard and modify each of the Other, specify inputs, pasting the script into each Code in control input and modifying it as required from question to question.